Secured by Design is a crime prevention project operated by the Association of Chief Police Officers (ACPO). The Secured by Design scheme focuses on the design and security of home improvement products, including windows and doors. By using the Veka profile in all our installations from our supplier Consort, CSJ’s windows and doors are certified as Secured by Design. BS 7950: 1997 Specification for enhanced security performance of casement and tilt/turn windows for domestic applications. BS PAS 24-1: 1999 Enhanced security performance requirements for door assemblies – Part 1: Single leaf, external door assemblies to dwellings. 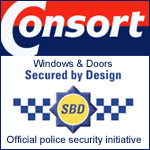 *Supplier refers to Consort Windows Ltd, authorised Secured by Design members.